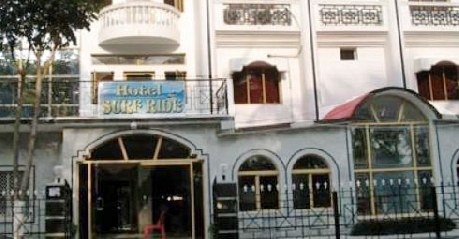 Surf Ride is a popular budget property located on the Digha Beach side. The hotel is very popular among tourists and business travelers for offering comfortable and elegant accommodation options. Surrounded by natural beauty on all the sides, Surf Ride makes for a perfect vacation destination for families, group travelers and even colleagues to cool off. Patrons are offers five categories of accommodation choices that include Non Air Conditioned Rooms, Semi Deluxe Rooms, Deluxe Rooms, Super Deluxe and Four Bedded Rooms; to cater to different requirements of hotel’s diverse clientele. The rooms are well maintained and are fitted with all necessary amenities and features to keep patrons happy and satisfied during their stay here. To cater to the culinary requirements of the guests, Hotel Surf Ride also has an onsite restaurant that serves delectable platter of Indian, Chinese and Continental dishes. Foodies might also like to try the local delicacies served here; they are prepared as per traditional methods and taste amazing. Apart from these; the hotel also offers other services and facilities to make guests’ stay more comfortable at Surf Ride. These include travel desk, cab and car hire facility, express laundry service, sightseeing facility, doctor on call and many others. For business travelers, the hotel has a well equipped conferencing facility and hall along with modern secretariat services. Perfect location and host of modern amenities make Surf Ride an ideal hotel for recreation, leisure or business trips to Digha. Non Air Conditioned Rooms are the simplest accommodation choice available at Surf Ride hotel. These rooms have very minimalistic décor and interiors yet are very pleasant to stay in at. The rooms are decorated with elements from local culture that offers a firsthand view of Digha’s heritage. Moreover they are fitted with lot of basic amenities like private bathroom, color television set, comfortable bed, chair and desk unit, hot and cold running water and room service, to make clients feel pampered. The affordable pricing make these room a big hit among budget travelers. Running on a tight budget but looking for an elegant and tourist friendly staying option in Digha. Head to Hotel Surf Ride and book an Air Conditioned Semi Deluxe Room! These rooms are structured very uniquely to offer maximum space to guests to conduct their daily activities. The décor of the room is planned very elegantly and reflects simplistic charm that will please the guests. Moreover, the rooms are provided with all basic necessities and features to pamper patrons during their stay here. The features included in the room are private bathroom, hot and cold running water, subscription to premium television channels, color television set, room service and many others. Budget pricing and host of amenities make this an ideal accommodation choice for solo and business travelers. Looking for budget friendly accommodation choice in Digha that also offers all necessary amenities and features, then be sure to check out the Deluxe Rooms available here. The rooms are designed very tastefully to reflect class and elegance. The décor is inspired by local culture and gives us a glimpse of local traditions and heritage. Furnished with a comfortable bed, sofa unit and study desk; the room is sure to cater to all requirements of clients. Moreover, the Deluxe rooms are loaded with all basic necessities like private bathroom, hot and cold water, color television, premium television channels, telephone and room service. The prime location and superior amenities make Deluxe Rooms a very good deal for business as well as leisure travelers. Luxury meets Comfort and takes the form of Super Deluxe Rooms available at the seafront hotel Surf Ride in Digha. The Super Deluxe Rooms are the best offering available at the hotel and are finished with best features and amenities. Preferred by VIP guests as their accommodation choice in Digha, the rooms offer mesmerizing view of the sea that complements the décor. The interiors are inspired from the local culture and offer a glimpse in local heritage. As far as amenities go, the room is fitted with premium amenities like private bathroom, hot and cold running water availability, comfortable bed, spacious sofa unit, mini refrigerator, study table, color television with subscription to premium channels, telephone with direct dial facility and round the clock room service. Traveling with a group of friends or your family; if space is what you are looking for, then the Four Bed Air Conditioned Rooms available at the Surf Ride Hotel are ideal for you. The rooms are structured in a unique fashion to maximize the space on the inside freeing enough room for patrons to carry out their daily activities with ease. The Room consists of four comfortable beds that are furnished with comfortable mattress and premium linens. Moreover, the room is equipped with premium amenities and features to cater to any and every requirement of clients. These amenities include private bathroom, hot and cold running water availability, sofa unit, mini refrigerator, study table, color television with subscription to premium channels, telephone with direct dial facility and round the clock room service. All these amenities and oodles of space make this a perfect vacation stay option for group travelers. Enjoy the best of seafood and several other popular dishes at the in house restaurant located on the premises of Hotel Surf Ride, Digha. The restaurant is located in calm and serene environment and directly looks over the seaside that gives it very soothing ambience. The décor is very simple and elegant and draws its inspiration from local culture and artwork. Patrons are served Continental, Chinese and Indian along with mouth watering local delicacies. The local seafood delicacies are prepared as per local recipes using best of herbs and spices that give them unique flavor and aroma. The restaurant also follows high hygiene standards that make patrons comfortable while dining here. The amazing food and unique setting makes dining here a very memorable experience for guests.